Degaussers were yard craft that employed a high-current electrical cable to "wipe" the magnetic field of steel-hulled ships. This gave the ships some temporary immunity to magnetic mines. 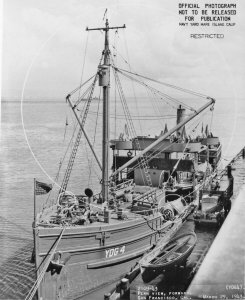 Since the Japanese never developed a magnetic mine of their own, and employed only a small number of captured British magnetic mines, only a small number of these craft were deployed by the U.S. Navy to the Pacific, most likely to protect shipping from friendly mines laid offensively earlier in the war that had not been completely swept.